The name Legnano entered in the world of cycling in 1908, when Emilio Bozzi founded his company “Emilio Bozzi & C”.m based in Milan, Italy. He was a great businessman and had idea was to produce hiqh quality bicycles. In the meanwhile Bozzi acquired several brands like Pearl and Frejus. “The logo of the Legnano brand is based on the warrior “Alberto da Giussano“. Alberto da Giussano was an Italian legendary Guelph warrior during the wars of the Lombard League against Frederick Barbarossa in 12th century. A tradition, probably fabricated by 14th century Milanese chroniclers, attributes to him the deed of forming the “Company of Death” that defended the Carroccio of the League at the Battle of Legnano. 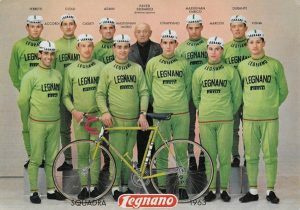 Legnano was an Italian professional cycling team active from 1908 to 1966. It is ranked as the 6th most successful cycling team in history. Many biggest victories were achieved on Legnano bikes, thanks to biggest champions of the cycling history like Alfredo Binda, Learco Guerra, Gino Bartali, Fausto Coppi and Ercole Baldini. The team participated in the Giro di Italia 46 times, won the team classification 11 times and earned 135 stage wins. 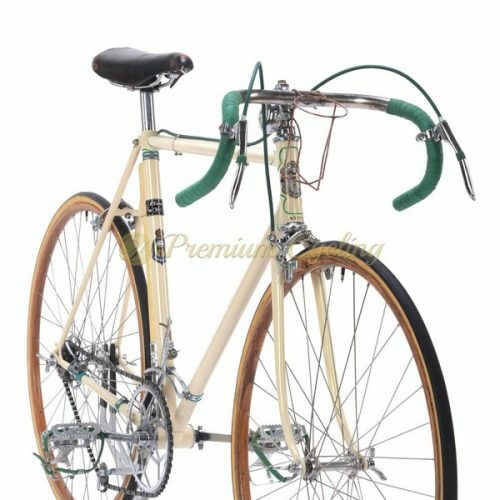 From the 1930’s to the mid 1950’s, the top road bike from Legnano was the Tipo Roma. To commemorate Ercole Baldini’s gold medal in the road race at the 1956 Olympic Games in Melbourne, Legnano changed the name to the Roma Olimpiade. Baldini also won the World Hour Record in Milan on a Legnano in 1956, breaking the time that was set by Fausto Coppi on a Legnano in 1942. 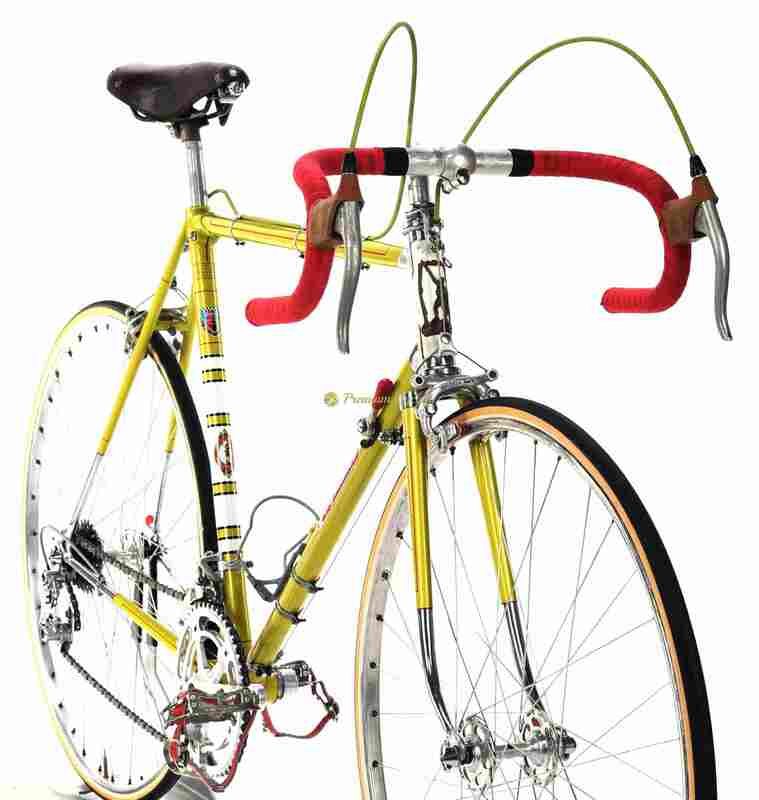 The Roma and later the Roma Olimpiade was mostly equipped with full Campagnolo trim was a top racing machine for decades. Proudly presenting this legendary Italian top class racing machine – LEGNANO Roma Olimpiade which dates back to 1962/63. The frame shines in iconic Legnano paintjob, made of special seamless drawn light tubes FALCK (famous Italian high end tube provider in 1960s), Campagnolo drop-outs and typical Legnano lugs and seat clamp which has a bolt under the top tube. The cheery on the top of the cake are the parts: Campagnolo Record 1st gen groupset with high flange hubs marked Legnano, Uniersal 61 brakes and levers, TTT Gran Prix cockpit, NiSi rims, BROOKS saddle. Iconic and very collectible! Nice catch for any vintage bike collector. L’Eroica ready. Condition: Used, but good condition. The frame has no cracks, no dents, not bent. All parts are working fine.